LA-based producer and DJ VenessaMichaels has been putting out some popping music this year. Michaels’ nostalgically-tinged 90s R&B sounds show themselves in many of her original tracks, and combined with an affinity for future bass influenced jersey club, it’s no wonder that her #2090 brand is so strong. She also recently released original single “Without You“, featuring Lil Texas. Basically, this lady has been on a roll, which is just so admirable. 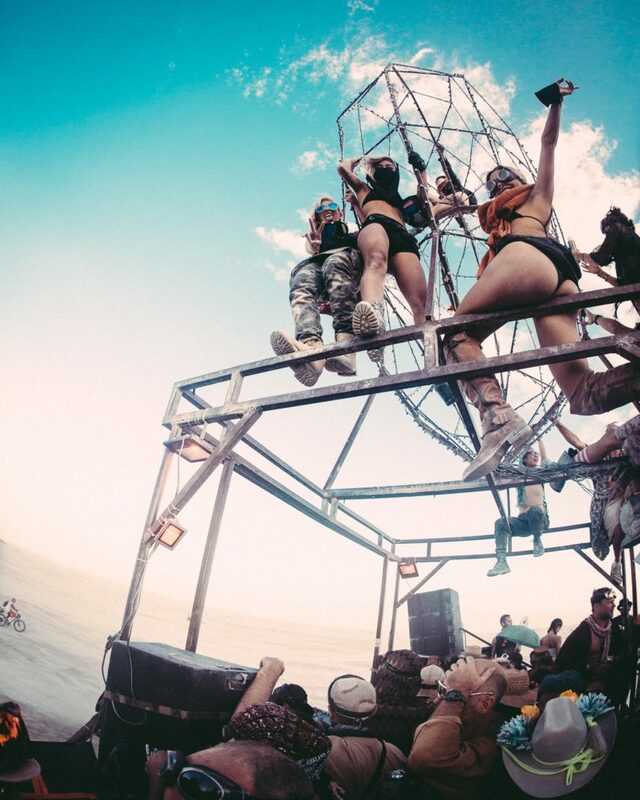 Check out our interview with VenessaMichaels as well as some AMAZING photos from her first time attending Burning Man 2016 below! 1) How has your year gone so far, and what can listeners expect to hear from you soon? It’s been a crazy year to be honest. Lots of downs, followed by lots of ups…but that’s just life. I’ve been working on tons of new music. The Summer Series of originals has just ended, so I’m making a move toward uptempo fun jersey, hip hop, breakbeat dance tracks. I am working on a collab EP with more original vocalists, rappers, and producers that have a similar vision. More to spill soon 🙂 ALSO some surprise #2090 throwbacks for the fun of life. 2) Could you explain a bit more about what your #2090 brand is? From what we know, it sounds like a super cool concept 🙂 What goals do you have for the #2090 brand? 2090 is the future. My inspiration comes from growing up with 90s music and fashion. So I am highly influenced by that era and to flip it into something innovative is the mindset behind 2090. For others, 2090 might mean taking elements of other eras or inspirations and adding a new vision to it. It’s an ideal. 2090 has already become its own independent label as of this year. 2090 has been a party sponsored by KSWISS at SXSW. 2090 is also to become a clothing line. There are many outlets for the expression of 2090 that will all be explored very soon. 3) You being a 90s gal and all that, we must know… who is your 90s celebrity/music crush? No Doubt was everything to me, so Gwen Stefani. Also, Beyoncé <3 Both are queens. 4) What’s your songwriting process like? It changes all the time. Often I’ll write an idea in my notepad and just flow some words down. Depending on my mood I will just start writing whatever’s on my mind. I try and write a hook first, or think of a concept and then work around it. Other times, I’ll write the whole first verse and get stuck and figure it out later. Writing over a chord progression is most simple to me. I try never to think too much when it comes to songwriting, then it gets messy. It should all be honest and tell a story, in my personal opinion. 5) How did you get into the unique Jersey club sound that seeps into much of your music? I started hearing Jersey only a couple years ago. Major influences to that were Sliink, R3LL, & Trippy Turtle. 6) What do you wish listeners would feel or experience as they listen to your music? Anything. I don’t want them to feel a certain way, I just hope there’s something to feel when listening. 7) How was Burning Man?! Heard it was your first time there! It was another planet. Biking everywhere with bandanas and goggles made you feel like you were a ninja on the playa. Climbing on cages and dancing on art cars was the most reviving feeling ever. All good music and amazing people. I would recommend it to anyone. 8) What’s something you experienced at Burning Man that you would not have expected? When they say dust storms, they mean it. Like yo, if you didn’t have your goggles on and thought that you were gonna get away with just sunglasses you’re wrong. I made this mistake and came back with dust inside my eyes and a new mask of white sand eyes. It’s honestly insane. Also staying up till 12pm the next day to go on another bike ride to a stage with a DJ playing tech house. It doesn’t feel like time exists there. People giving away free pancakes and coffee with hammocks in an open tent. All of it was unexpected. Didn’t have any bad things happen, but the best thing was the power of the Temple. With so many people paying homage to lives that have impacted them made an impact on anyone visiting the Temple. You were able to write something to a lost loved one and there were thousands of people and animals that were respected at this powerful place. There was an unreal amount of energy surrounding this place that it’s impossible to describe. Also, watching the pyramid burn at 6:30am with the sun rising behind it was beautiful. All of it was surreal. Not to mention, the good company. 10) Where’s your favorite venue/place to perform in LA? Elsewhere? So far, my favorite place to perform in LA was The Echoplex. Not sure if it counts as LA, but also The Yost. Outside of LA was probably Vegas, at The Foundry. 11) And lastly… any shows or exciting news coming up that you would care to share with our readers? I’m doing a show with a cool dude in New York City next month (: Stay tuned on collabs, lots of new music coming up. Stay updated on all things VenessaMichaels on Soundcloud, Facebook, and Twitter.